Alabama’s Gulf Coast has turned red, white and blue for Veterans Day, an annual holiday honoring military veterans. If you’ve wondered what a deckhand does on her holiday – she goes fishing, of course. Mandy Prell of Pensacola, Florida, who is a deckhand on the “Zeke’s Lady,” a charter boat based at Zeke’s Landing Marina in Orange Beach, Ala., also manages the dock store. This special red snapper season continues until 12:01 am on November 22, but fishing at Orange Beach doesnÂt end then. 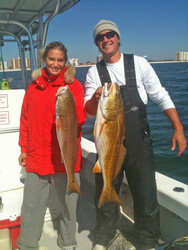 The bull redfish season is just beginning and generally lasts throughout the winter months. The first Sunday in November, Prell went out with Captain Bryan Reeves, who was captaining the “Riptide” charter boat that day, and a friend to search for schools of big redfish. “We went just west of Perdido Pass on the Alabama/Florida border looking for diving birds,” Prell says. “The big schools of redfish had forced the baitfish to the surface. When the seagulls saw the baitfish just under the water, they would dive on the baitfish to catch and eat them. Baitfish have two choices. They can dive deeper and get eaten by redfish or stay near the surface and get picked-off by seagulls. So, anglers depend on diving seagulls to learn the locations of schools of big redfish. We saw several groups of diving birds and a dozen or more boats fishing the schools of redfish. Many anglers fish with light line and spinning tackle to catch the big bull reds at Orange Beach. With light line and light tackle, playing a redfish for 10 to 45 minutes isn’t uncommon. The redfish often weigh from 12- to 20-plus-pounds each. Because of the size of the redfish caught, anglers release most of them. The limit is one bull red per person. Professional anglers like Prell and the captains at Orange Beach rarely keep any of the giant redfish. “After we caught our redfish, we went to the west jetty at Perdido Pass and caught white trout and bluefish in preparation for Veterans Day,” Prell explains. “So, I guess we had a red, white and blue day of fishing.” Prell and her party caught all their fish on lead-head jigs with a 3-inch pearl white Berkley Gulp! Alive! Pogy.